Foodista | Recipes, Cooking Tips, and Food News | Rice Balls with Spinach & Red Sauce with Fennel!!! 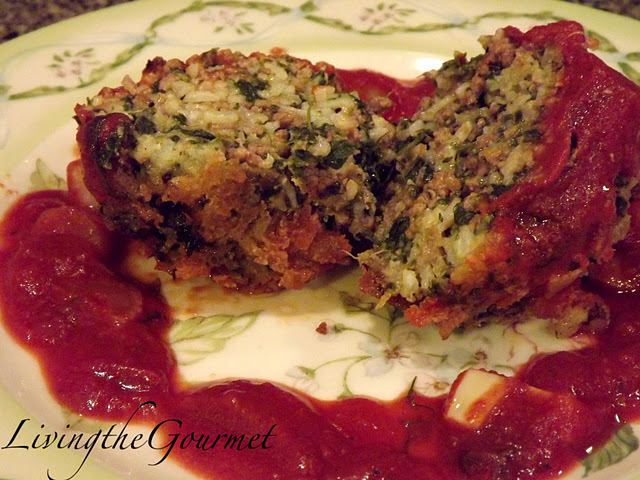 Rice Balls with Spinach & Red Sauce with Fennel!!! Heat a large frying pan with a drizzle of olive oil. Add the frozen spinach and ground beef. Sauté until the ground beef is cooked and the spinach is thawed and incorporated with the ground beef. Place in colander to drain completely. Set aside to cool. Beat three of the four eggs and add to the spinach and ground beef. Add the cooked rice, grated Romano cheese, shredded mozzarella and all of the seasonings and mix well. In a separate shallow dish beat one egg. In another shallow dish place the bread crumbs. Form the mixture into balls and dip in the egg wash and then roll in the bread crumbs. Heat a large frying pan with about 1 inch of vegetable oil for frying the rice balls. Carefully place the rice balls in the hot oil. Fry about 4 minutes on each side, until a beautiful golden color is achieved. Heat a large frying pan with a drizzle of olive oil. Add the celery, fennel, garlic, marinated peppers and raisins, squeeze the lemon juice and then add the piece of lemon. Let this all sauté until the celery is tender. Add crushed tomatoes and all of the seasonings. Let this simmer for about 10 – 15 minutes. Plate the rice balls and top with the sauce, grated Romano cheese and a drizzle of olive oil. These are a delicious treat as an appetizer or light dinner with a beautiful side salad.